Charles Lenox jumps headlong into the detective business to help a friend in need in this enthralling first mystery in the New York Times bestselling series. Charles Lenox, Victorian gentleman and armchair explorer, likes nothing more than to relax in his private study with a cup of tea, a roaring fire and a good book. But when his lifelong friend Lady Jane asks for his help, Lenox cannot resist the chance to unravel a mystery. Prudence Smith, one of Jane's former servants, is dead of an apparent suicide. But Lenox suspects something far more sinister: murder, by a rare and deadly poison. The grand house where the girl worked is full of suspects, and though Prue had dabbled with the hearts of more than a few men, Lenox is baffled by the motive for the girl's death. When another body turns up during the London season's most fashionable ball, Lenox must untangle a web of loyalties and animosities. Was it jealousy that killed Prudence Smith? Or was it something else entirely? And can Lenox find the answer before the killer strikes again—this time, disturbingly close to home? 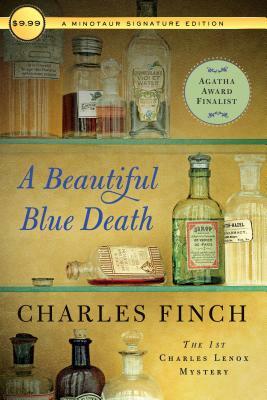 Charles Finch is the USA Today bestselling author of the Charles Lenox mysteries, which begin with A Beautiful Blue Death. His first contemporary novel, The Last Enchantments, is also available from St. Martin's Press. Finch received the 2017 Nona Balakian Citation Award, for excellence in reviewing from the National Book Critics Circle. His essays and criticism have appeared in the New York Times, Slate, Washington Post, and elsewhere. He lives in Los Angeles.